During the First World War approximately ten million military personnel died. Most of the deaths were on the battlefields of Northern France and Belgium, but there were many who died closer to home. 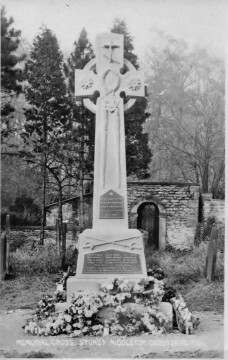 In 1930 the then Imperial War Graves Commission compiled and published The War Graves Of The British Empire, a register of the names of those who fell in the Great War and are buried in the Cemeteries and Churchyards in the Administrative County of Derby. To find the names of those buried in a particular Derbyshire Cemetery or Churchyard, or elsewhere go onto the Commonwealth War Graves Commission website and enter the relevant details. 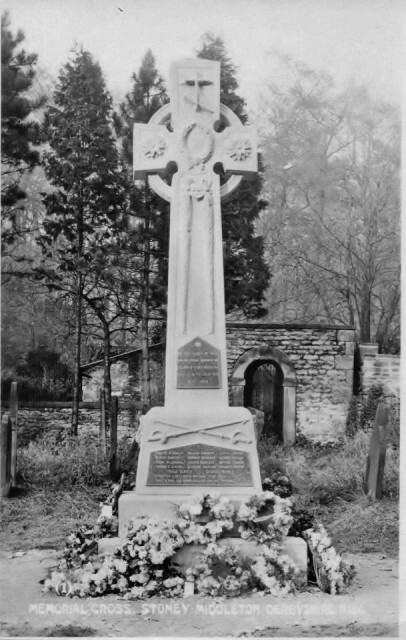 In the grounds of St Martins church in Stoney Middleton there is large gritstone memorial cross set on a plinth. It bears the names of the 14 fallen men of the village who gave their lives in WWI. 1914 – 1919 they should never be forgotten.